The Raja of Amethi and chairman of the Congress Campaign Committee, Dr Sanjay Singh is all set to field his wife Amita Singh from the seat. Are Congress bastions, Amethi and Rae Bareli, set for a battle of Ranis in Uttar Pradesh poll? 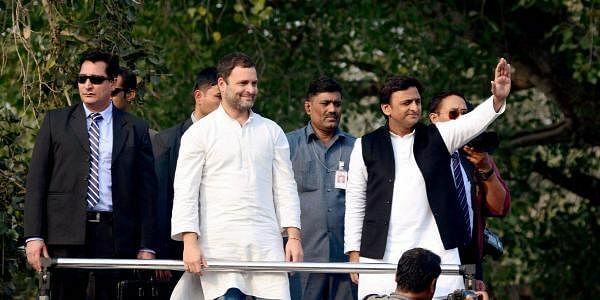 LUCKNOW: Despite organising four joint rallies and some impressive roadshows ahead of the crucial Uttar Pradesh assembly polls, the Samajwadi Party-Congress alliance seems to be plagued with confusions over the seat-sharing arrangement in over 12 seats in the state. The alliance leadership is grappling with the issue of pacifying those candidates who are facing each other in over 12 seats across the state. The most contentious of these is Amethi. The Samajwadi Party, which has fielded sitting MLA, UP minister and Mulayam-loyalist Gayatri Prajapati here, is not ready to concede the seat to the Congress. However, the Raja of Amethi and chairman of the Congress Campaign Committee, Dr Sanjay Singh is all set to field his wife Amita Singh from the seat. Calling it a matter of prestige, Sanjay Singh is not ready to step back from his decision. “Amita will file her paper on February 9 from the Amethi assembly seat,” he asserted. Giving an interesting twist to the Amethi contest, the BJP has fielded Sanjay Singh’s estranged wife Garima Singh from this seat. Amethi will be going to the polls in the fifth phase of the polls on February 27. Apart from Amethi, Gauriganj and Salon in the Amethi parliamentary segment along with Sareni in Rae Bareli Lok Sabha segment are also caught in a row where candidates of both the parties are set for a face-off. While Congress candidates are not ready to withdraw from the former three seats, Samajwadi Party (SP) candidate Devendra Pratap Singh is ready to fight Ashok Singh of the Congress from Sareni. “As of today, candidates of both the parties are contesting on a number of seats, but these issues will be resolved soon,” said UPCC chief Raj Babbar while releasing his party’s manifesto for UP elections here on Wednesday. Babbar attributes the entire confusion and dispute to the delay in ticket allotment and asserts the election is going well for the alliance. However, he forgets the situation is tricky in other parts of the state as well. In state capital Lucknow, the SP has already announced the name of senior minister and sitting MLA Ravidas Mehrotra for Lucknow (Central). After the alliance, Maroof Khan of Congress also filed his nomination from the seat on the pretext of the high command’s order. Neither Mehrotra nor Khan is ready to withdraw despite their respective leaders’ intervention. Now, both are set to face each other on the prestigious seat—much to the benefit of BJP’s Brijesh Pathak, a BSP turncoat. Interestingly, these are not the only cases of confrontation between the alliance partners. Of the 169 seats going to polls during the first three phases, the Congress and the SP candidates are facing each other in over 12 seats. From Zaidpur seat in Barabanki, the Congress has fielded Tanuj Punia who is the son of a former bureaucrat and Congress Rajya Sabha (RS) member, PL Punia. Tanuj Punia is facing SP's Ram Gopal who was expelled from the party after refusing to withdraw. However, Ram Gopal later withdrew his candidature but could not withdraw his papers as the date was already over. Similarly, though the Congress party convinced Pramod Jaiswal, younger brother of former union minister and senior Congress leader Sri Prakash Jaiswal, to pull out of Arya Nagar in Kanpur in favour of SP's Amitabh Bajpai, Jaiswal could not withdraw his papers and technically remains a candidate. "We are hopeful to resolve these issues in the next one or two days ahead of the first phase of polls in western UP," said SP spokesman Ashish Yadav. Both the allies are also facing a strong rebellion from those within the cadre who were aspiring for tickets but have been denied under the seat sharing formula. The SP is facing a bigger challenge from its rebel candidates, who are either fighting as independents or from other parties in over 100 seats across the state.